While seen as a rather old-fashioned bit of kit by many, the pressure cooker is actually a very useful thing to have in the kitchen. Pressure cookers produce delicious, unctuous food such as braised duck legs, oxtail and pork belly in around a third of the time normally taken. After the initial investment, the pressure cooker will save you money on your gas and electric, as well as give you the opportunity to experiment with delicious slow-cooked dishes that you may not normally have the patience for. The high temperature and wet, steamy environment of a pressure cooker produces the same effects that long, slow braising would. Simon Hulstone uses one to cook duck legs in 30 minutes while Alyn Williams cooks oxtail with reduced red wine, beef stock and vegetables in this Beef and asparagus recipe for flavourful, flaky meat in only 40 minutes. Pressure cookers are not just used for meat though; some recipes use pressure cookers for beans, risottos, poaching fruit or steaming puddings – Pascal Aussignac even uses one to sweat onions. They are also a vital piece of kit for mountaineers as the boiling point of water increases at altitude, making it harder to boil liquid without a pressure cooker. For this reason, portable travel-versions have been made that are available in camping shops. Pressure cookers come in a range of sizes, depending on the number of people you are wanting to feed, though bear in mind that you should only fill a pressure cooker two thirds full for safety reasons. 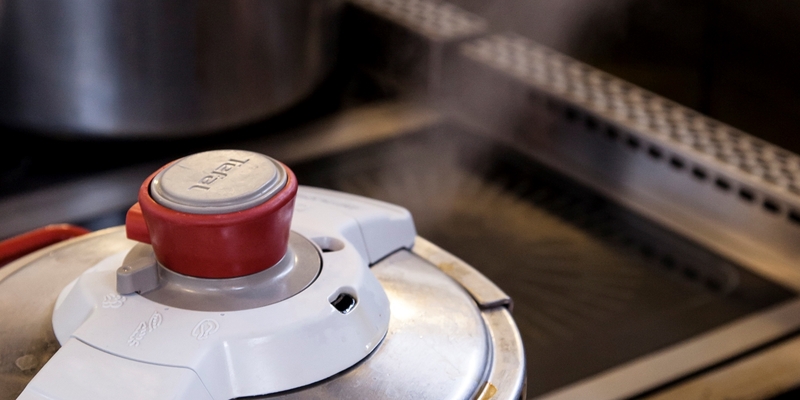 Most pressure cookers come with at least 2 different pressure settings but electric varieties have a range of heating and timing systems, perfect for multi-stage cooking. The durability of a pressure cooker comes down to the material it is made of. Thick bases and stainless steel are all signs of a good, long-lasting cooker that will serve you well throughout the years.